Two ships were anchored at the 'Bravo' anchorage overnight, one of which - APOLLO EAGLE - had already been there for a few days. 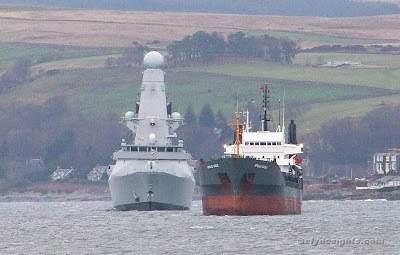 HMS DARING joined her on Saturday evening, having spent the previous 24 hours manoeuvring in the lower firth. Apollo Eagle is awaiting orders and only decided to anchor there as she headed out of Glasgow. APOLLO ships have anchored there on a number of previous occasions while brokers arrange their next cargoes. It's quite a common practice.